Daesh fighters battled Syrian insurgents in the northwestern province of Idlib on Saturday, a monitoring group and a rebel commander said, accusing pro-government forces of opening a corridor for the jihadists to reach the region. 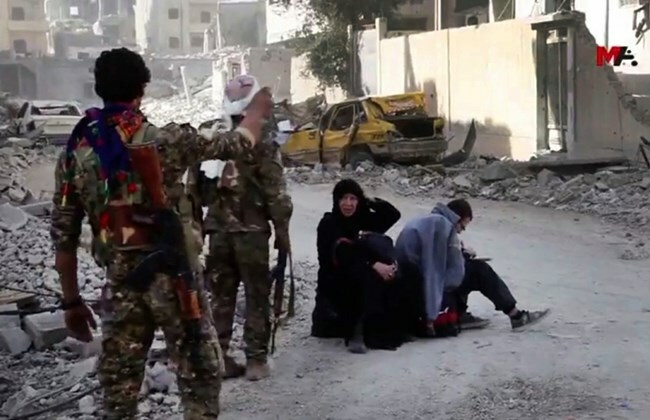 The Syrian Observatory for Human Rights said government forces had allowed Daesh fighters to leave a besieged pocket of territory at the intersection of Aleppo, Idlib, and Hama provinces, and then go to southern Idlib. A military news outlet run by Lebanon’s Hezbollah, which is fighting on the side of the Syrian government, reported gains by the army and its allies against Daesh in that pocket but made no mention of the jihadists being allowed to leave. A commander in the alliance fighting alongside Syria’s army said the Daesh militants left the enclave. “The pocket is finished. A crossing was opened till they exited, and then it was closed,” the commander said. “The strategic importance of this achievement is that it ends the presence of the terrorist Daesh organization in both Aleppo and Hama provinces,” the statement said. The advance also secures supply routes between Hama and Aleppo and links them to the southeast desert near the Iraqi border, it said. The military said it had destroyed militant targets, and made no mention of a corridor letting Daesh fighters depart. “The regime started the operation against this pocket seven days (ago). Suddenly they were able to take 80 villages and towns after giving them a corridor,” said Rami Abdulrahman, director of the Observatory, a Britain-based war monitoring group. Hasan Haj Ali, commander of the Free Idlib Army rebel group, confirmed the report. Ali said his fighters were taking part in clashes against some 200 Daesh fighters who had arrived in southern Idlib early on Friday. A source in the Ahrar al-Sham faction said Daesh fighters had pushed into south Idlib from government territory. Idlib is the largest chunk of Syrian territory held by insurgent factions opposed to President Bashar al-Assad’s government. Factions, including al Qaeda’s former affiliate in the Syrian war, dominate the province.